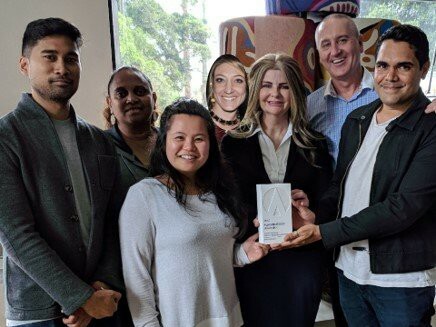 Fresh from picking up Building Product category at the 2017 Sustainability Awards, WINYA has now added more silverware to their trophy cabinet by winning a Banksia Award for 'Indigenous Leadership in Sustainability'. Set up in 1989, the Banksia Awards motto is to “inspire excellence in sustainability’ and past winners include Australia Post, ResourceSmart Schools and Barangaroo Reserve by Lendlease. Supplying workstations, sit-stand desks, task seating, lounges and storage, lockers and boardrooms through Indigenous employment focused manufacturing, Winya supplies large scale fit out and furniture to the ATO, Defence Department, and to builders like Laing O’Rourke and Lendlease. According to WINYA director Greg Welsh, the reason the company won a Banksia Award this year was because the comoany “takes a multi-layered approach” when it comes to sustainability. "We work with the communities all through the supply chain," he says. For example, WINYA’s Arnhem furniture range is a social and environmental collaboration with remote Northern Territory Indigenous land owners and a remote Indigenous mill to provide waste timbers off mine-site clearing to produce custom made soft seating. “Timber that would otherwise be burnt create Indigenous employment both in remote areas and apprenticeships in cities,” says Welsh.